The design goal was to create a simple, low cost personal mobility vehicle that could function in a four-season environment on city streets. (75%) within the community. This is where people live. This is also where livability is threatened by pollution and congestion. Their personal mobility options should be compatible with those community values. Local urban transportation is perfectly suitable for electric power since electric motors produce good torque and low end power for stop and go traffic, do not need transmissions, are off at signals because they do not need to idle. A small battery pack is adequate for these short trips and re-charging opportunities are available everywhere within the gird, from every outlet. Every convenience store is a power station. Energy efficiency is 1 cent per mile. This class of vehicle falls handily between the Bicycle and the Buick. 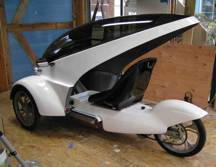 To achieve these design goals, a three wheeled Cyclecar stance (two wheels in front, one in rear) provides the most stable configuration. As such, the vehicle is licensed and insured as a motorcycle and would meet D.O.T. standards for this vehicle class. All controls are handlebar mounted and hand operated. A single piece fairing provides wind and weather protection, yet tilts forward to allow easy access and exit. The open sides eliminate the need for opening windows or doors yet permit hand and arm access to mail boxes, drive up windows etc. The fairing also reduces aerodynamic drag significantly, while increasing visual mass and presence in traffic. The driver sits at automotive height with other drivers, yet the smaller vehicle footprint creates more maneuvering room within the traffic lane. As a neighborhood use vehicle, performance need not exceed 40-50 mph enabling the vehicle to be quick but not fast since high-speed freeway traffic situations and the associated risks are avoided. Slower surface traffic conditions prioritizes maneuverability for parking, enabling four vehicles to park in one automotive parking space, as well as the many small spaces not available to cars. 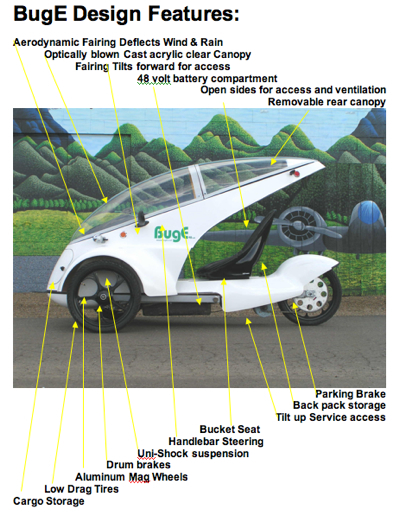 This concept is unique in vehicle architecture and is an appropriate design option for personal mobility in an age of sustainability and energy efficiency. The styling is dynamic and contemporary but human scaled and relevant. was a more complex and robust vehicle. As such, it was much more expensive to produce and the traditional business model used required far more capital investment to be viable. The BugE kit will sell for approx. $3000.